The 3 metre bronze cast statue of a female diver coming out of the water, pearl shell in hand, recognises and is dedicated to the women who have contributed to Broome's pearling history for over a century. 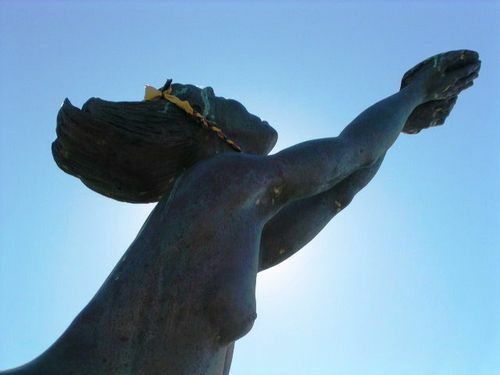 The statue of an Indigenous woman coming out of the water with a pearl shell also seeks to acknowledge those who were exploited as divers along the coastline south of Broome during the 'blackbirding' phase. "Blackbirding” was the forcible kidnapping of Aboriginal women to pearl luggers, where they dived for pearl shells in deep water, often without breathing apparatus. Unsurprisingly, many of the women drowned. The Memorial to Women of Pearling was funded by Shire of Broome and Kimberley Development Commission through Royalties for Region. Which turns into pearls as it fall in the sea "
On the foreshore of Roebuck Bay we honour the contribution of women to the pearling industry. Their love, commitment, endeavour, strength and vision helped make Broome the pearling capital of the world. Here the luggers would be laid up on the foreshore, where Asian indentured workers camps were set up and families and friends visited. This was a favourite spot for children to play all day long. This statue was officially unveiled 26 November 2010 by Hon. Wendy Duncan MLC. It was funded by Shire of Broome and Kimberley Development Commission through Royalties for Regions.